are cut to length, either with a metal-cutting saw or with a torch, and are welded together. Two vertical support posts are welded to the forward section of the chassis. These posts hold the upper end of the two wheel support towers when they are in their lowered position for travelling. to the pair below it. V-shaped lighting booms are installed between the center of every other outer crossmember as the stack is assembled. This overlapping pattern of lights produces a double-star effect. 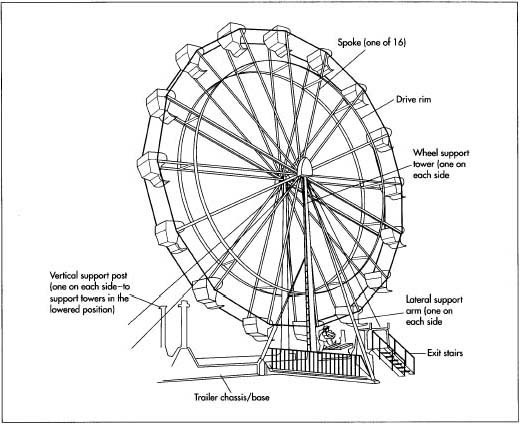 With the exception of a main power line failure, can a Ferris wheel breaks down for mechanical reasons, and if so, what would that be, and can it be quickly repaired? My reason for asking is that I am a freelance writer in the midst of writing a book for middle grade readers. Any assistance you can provide will be very much appreciated.